With the 2013 Dingos’ pre-season fast approaching, the club is pleased to announce the appointment of Justin Robertson as its head coach. “Robbo” returned to the Dingos in late 2011 after two years of living in Australia. Since his return, he has been an active member of the club, organizing many winter training sessions at the Dynamic Conditioning Centre as well as being an assistant coach. Robbo won the 2009 Clubman Award, and was again nominated in 2012 for his off-field involvement in the club. Robbo also had a strong season on the field in 2012, finishing in the top-10 in the Dingos’ Best and Fairest. The Dingos are also pleased to announce that Chris “Butch” Buczkowski will be continuing his role as Assistant Coach in 2013. 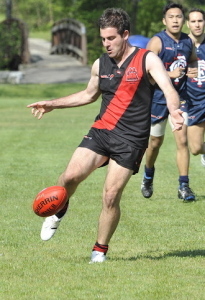 Butch has been a member of the Dingos since 2001, winning three premierships, a Best and Fairest and four leading goal-kicker awards. Butch was also the head coach of the 2012 Canadian Under-23 squad that traveled to Ohio for the 49th Parallel Cup. The Dingos would like to acknowledge the hard work of Mick McFarlane, who stepped back from his role as head coach at the end of the 2012 season. Mick was head coach of the Dingos for three seasons, and did everything in his power to ensure that the team reached its full potential. The Dingos are beginning training at the Dynamic Conditioning Centre (DCC) on Mondays at 8pm. Email coach@torontodingos.com for more information.